He wanted to join the Marines, but he was too short. The paratroopers wouldn't have him either. Reluctantly, he settled on the infantry, enlisting to become nothing less than one of the most-decorated heroes of World War II. 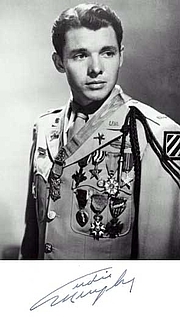 He was Audie Murphy, the baby-faced Texas farmboy who became an American Legend.Murphy grew up on a sharecropper's farm in Hunt County, Texas. Left at a very young age to help raise 10 brothers and sisters when his father deserted their mother, Audie was only 16 when his mother died. He watched as his brothers and sisters were doled out to an orphanage or to relatives. Seeking an escape from that life in 1942, he looked to the Marines.War had just been declared and, like so many other young men, Murphy lied about his age in his attempt to enlist. but it was not his age that kept him out of the Marines; it was his size. Not tall enough to meet the minimum requirements, he tried to enlist in the paratroopers, but again was denied entrance. Despondent, he chose the infantry. Following basic training Murphy was assigned to the 15th Regiment, 3rd Infantry Division in North Africa preparing to invade Sicily. It was there in 1943 that he first saw combat, proving himself to be a proficient marksman and highly skilled soldier, consistently his performance demonstrated how well he understood the techniques of small-unit action. He landed at Salerno to fight in the Voltuno river campaign and then at Anzio to be part of the Allied force that fought its way to Rome. Throughout these campaigns, Murphy's skills earned him advancements in rank, because many of his superior officers were being transferred, wounded or killed. After the capture of Rome, Murphy earned his first decoration for gallantry. Shortly thereafter his unit was withdrawn from Italy to train for Operation Anvil-Dragoon, the invasion of southern France. During seven weeks of fighting in that successful campaign, Murphy's division suffered 4,500 casualties, and he became one of the most decorated men in his company. But his biggest test was yet to come. On Jan. 26, 1945, near the village of Holtzwihr in eastern France, Lt. Murphy's forward positions came under fierce attack by the Germans. Against the onslaught of six Panzer tanks and 250 infantrymen, Murphy ordered his men to fall back to better their defenses. Alone, he mounted an abandoned burning tank destroyer and, with a single machine gun, contested the enemy's advance. Wounded in the leg during the heavy fire, Murphy remained there for nearly an hour, repelling the attack of German soldiers on three side and single-handedly killing 50 of them. His courageous performance stalled the German advance and allowed him to lead his men in the counterattack which ultimately drove the enemy from Holtzwihr. For this Murphy was awarded the Medal of Honor, the nation's highest award for gallantry in action. By the war's end, Murphy had become the nation's most-decorated soldier, earning an unparalleled 28 medals, including three from France and one from Belgium. Murphy had been wounded three times during the war, yet, in May 1945, when victory was declared in Europe, he had still not reached his 21st birthday. Audie Murphy returned to a hero's welcome in the United States. His photograph appeared on the cover of Life magazine and he was persuaded by actor James Cagney to embark on an acting career. Still very shy and unassuming, Murphy arrived in Hollywood with only his good looks and — by his own account — "no talent." Nevertheless, he went on to make more than 40 films. His first part was just a small one in Beyond Glory in 1948. The following year he published his wartime memoirs, To Hell and Back, which received good reviews. Later he portrayed himself in the 1955 movie version of the book. Many film critics, however, believe his best performance was in Red Badge of Courage, Stephen Crane's Civil War epic. After nearly 20 years he retired from acting and started a career in private business. But the venture was unsuccessful, eventually forcing him into bankruptcy in 1968. Murphy, who once said that he could only sleep with a loaded pistol under his pillow, was haunted by nightmares of his wartime experiences throughout his adult life. In 1971, at the age of 46, he died in the crash of a private plane near Roanoke, Va. Audie Murphy is buried in Arlington National Cemetery, just across Memorial Drive from the Memorial Amphitheater. A special flagstone walkway has been constructed to accommodate the large number of people who stop to pay their respects to this hero. At the end of a row of graves, his tomb is marked by a simple, white, government-issue tombstone, which lists only a few of his many military decorations. The stone is, as he was, too small. Audie Murphy is currently considered a "single author." If one or more works are by a distinct, homonymous authors, go ahead and split the author. Audie Murphy is composed of 2 names. You can examine and separate out names.